Every year, an estimated 1.8 million newborns die from breathing related problems. Precious time is lost when birth attendants interrupt critical ventilation to check a newborn’s heart rate by hand. It's a devastating problem, but thanks to a group of unrelenting individuals, that could change. 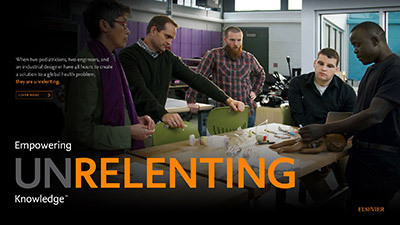 Elsevier brought together five inspiring minds, who used their knowledge and creativity to brainstorm a solution to the problem. Read our story and watch the videos. When Dr. Santorino Data steps off the plane from Uganda into the chilly Boston air, an event from the previous week still haunts him. The next day, he shows a video of what happened to four colleagues who have a particular interest in newborn care. 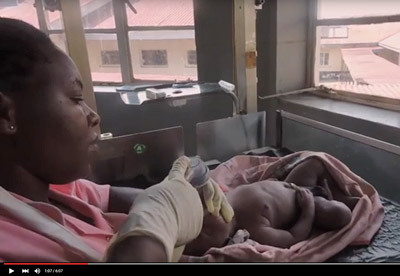 In the video, a newborn baby is not breathing, so the midwife pumps air into his lungs, squeezing the resuscitation bag while holding the mask around the baby’s nose and mouth to create a seal. “This is hard to watch,” says Dr. Kristian Olson, his gaze transfixed on the screen. A big part of the problem is that the midwife is alone. “This is the common situation in most developing countries,” explains Dr. Data, a lecturer of Pediatrics and Child Care at Mbarara University of Science & Technology who has trained frontline health workers in newborn care in Uganda, Ethiopia and Bangladesh and helped review the newborn training program developed by the American Academy of Pediatrics. Because the midwife needs to use one hand to seal the mask in place over the baby’s mouth and nose, she has to stop pumping air periodically to check baby’s heart rate, which she does by holding the umbilical cord with her fingers close to the baby’s belly. “You wouldn’t have had this video if I was in that room — I would have just dropped the camera and jumped into action,” Dr. Data says. He had asked an IT specialist to shoot a video immediately after a birth to document the processes they use at that hospital, and it just happened that this birth resulted in an emergency. Unfortunately, this occurrence is all too common. Breathing problems cause up to 1.8 million still births and newborn deaths every year, mostly in developing countries, and many breathing-related injuries such as cognitive impairment and cerebral palsy, according to the World Health Organization. “If a baby is deprived of oxygen in the first minutes, it’s difficult to know how that will affect the child even if it lives,” Dr. Olson says. 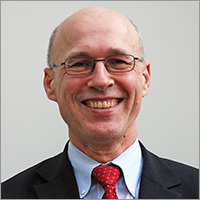 Dr. Olson is also a pediatrician, but unlike Dr. Data, he works in a state-of-the-art facility as Medical Director of the Consortium for Affordable Medical Technology (CAMTech) at Massachusetts General Hospital Global Health. In fact, when his wife gave birth to triplets there, there were 22 people in the room. Still, he’s no stranger to medical challenges in developing countries. Dr. Olson has worked in refugee camps along the Thai-Burmese Border and in Darfur, Cambodia and Ethiopia. In Indonesia, he developed a newborn resuscitation program for rural midwives. He quickly learned that many hospitals and health facilities cannot afford or maintain expensive equipment – and many births don’t take place in hospitals but in people’s modest dwellings. Once, he built an incubator for newborns out of old car parts. He was a reviewer for the Helping Babies Breathe (HBB) program before it launched and became a master trainer for the program. He met Dr. Data through CAMTech and only subsequently realized that Dr. Data is also a master trainer for the HBB’s educational program. So Dr. Olson was up for Elsevier’s 48-hour health challenge. 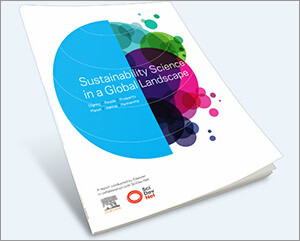 Elsevier is celebrating the unsung, the unseen and the yet unknown. We are proud to support collaboration and innovation every day through information and smart tools – and in special ways, like the global health challenge you can watch and read about here. For more stories about the people and projects empowered by knowledge, we invite you to visit Empowering Knowledge. Dr. Olson and Dr. Data would work with two engineers and an industrial designer to come up with an affordable device that would prevent scenes like the one they were witnessing. Currently there is no ideal method of heart rate monitoring at birth. To complicate matters, birth attendants in developing countries often lack proper equipment because it’s too expensive, specialized, or not widely available. As a result, emergency ventilation must be interrupted to check the newborn’s heart rate by hand. This costs precious seconds of ventilation during the Golden Minute — the critical minute immediately following birth where breathing or assisted ventilation should begin. Another delay comes from the practice of cutting and tying the umbilical cord so the baby can be transferred to a firm surface to begin ventilation. 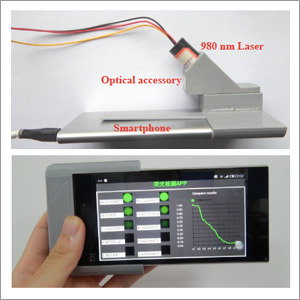 In response to this problem, the team had identified a pressing need to develop a simple, quickly administered, low-cost heart rate monitor for newborns. They realized that attaching this heart rate monitor to an umbilical clamp would be faster than tying and cutting the cord, while helping birth attendants recognize problems, act more quickly and focus on ventilation when needed. 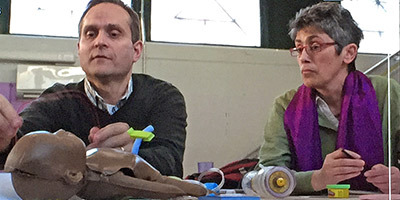 Now, they gather at The Possible Project, a “makers space” in Cambridge, Massachusetts, around a large table with resuscitation equipment and a rubber training newborn simulator mannequin that looks like a small doll. There, they start the day watching the video Dr. Data is showing. After six minutes, the baby finally begins to breathe, his crying a welcome relief to the team as well as the crew that’s filming the challenge for the mini-documentary you can watch at the top of this story. Meanwhile, another clock, mounted high on the wall, counts off precious minutes and hours in large red numerals. “I really believe that global health problems are not solved by charity; they are actually solved by sustainable business models,” says Dr. Data. And solving this problem called for an interdisciplinary team. 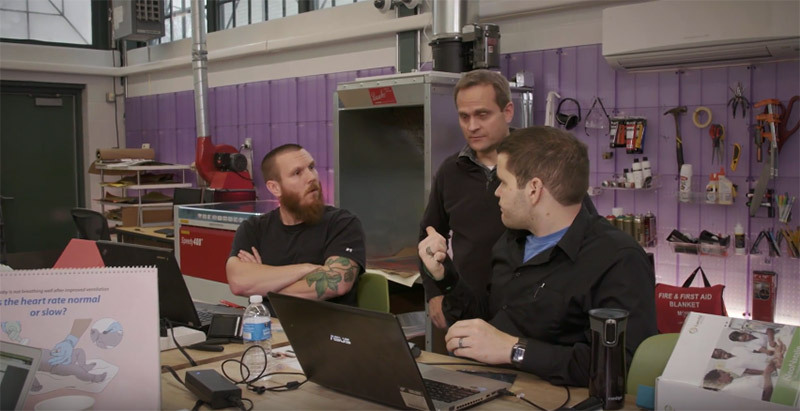 Dr. Data and Dr. Olson met one of the engineers, Dr. Kevin Cedrone, at a CAMTech and MIT joint hackathon, and they have been collaborating ever since. Dr. Cedrone has a PhD in mechanical engineering from MIT. Although his focus was on automotive engineering, Cedrone used discarded engine sensors in his lab to develop a prototype for a device to help newborn infants breathe — within 24 hours of receiving the challenge at the CAMTech/MIT ’s Hacking Medicine Hackathon at Massachusetts General Hospital in 2012. 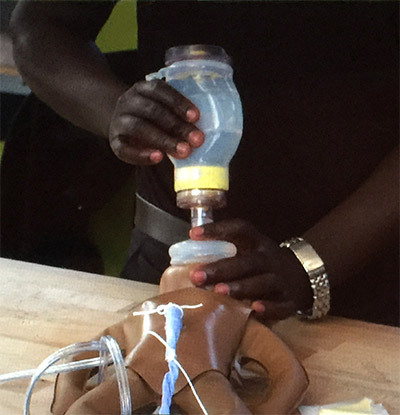 Dr. Cedrone’s team won first prize for developing the Augmented Infant Resuscitator (AIR), which has since received over $500,000 from Saving Lives at Birth and its partners. Subsequently, he quit his day job to work on developing AIR full-time. The other engineer is Jim Wright, a former US Marine and Iraq War veteran who used the GI bill to get his education as an electrical engineer. Along the way, he won several hackathons, and now he works with companies to develop innovative medical devices, primarily electrical sensors to gather and process data. 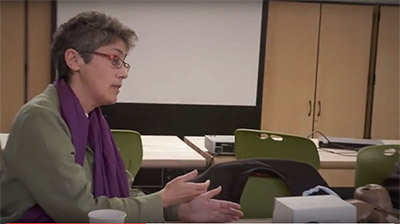 Rounding out the team is Beth Mosher, Associate Professor of Industrial Design at the Rhode Island School of Design. As an industrial designer, she draws on her unique background in archaeology and anthropology, which had her working on archaeological digs in Egypt and Bahrain and interning at the Smithsonian during college. Since then, her design projects – everything from surgical devices to footwear – have been exhibited internationally. Those were the questions the team would tackle in the hours ahead. If the baby's on the mother's abdomen, it's not a great surface. 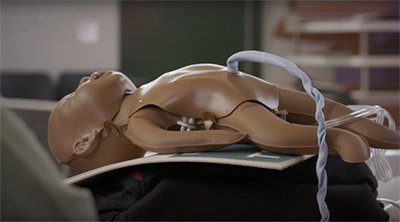 So if you throw in some kind of a tray that gives the midwife a harder surface ... Would something like that mean that you could resuscitate a baby without having to disconnect it? Within seconds, a makeshift tray is perched atop Dr. Olson's knapsack, which functions as the mother's abdomen. And on it goes, with team members grabbing scraps of string, wire and plastic to craft the parts they envision. Their mission: to help the birth attendant save time – and make their device affordable enough for hospitals and midwives in low-income regions. Dr. Cedrone’s engineering savvy comes into play after lunch as the team focuses again on the mechanics of combining an umbilical clamp with a heart rate monitor. 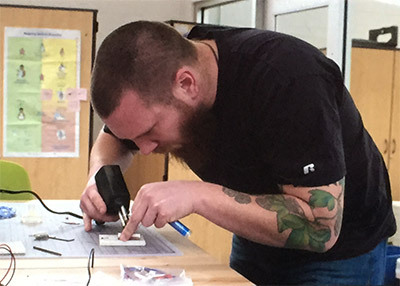 This time, he makes prototypes of the parts with the tabletop 3D printer he toted in during the lunch break. What would the midwife want? While the midwife on the video seems “unflappable,” she says, there must be enormous pressure for anyone in her situation. The birth attendant would be worried not only about the baby’s survival but the mother’s wellbeing and not letting her down. Meanwhile, minutes of pumping oxygen could seem like hours. She suggests a sensor that gives incremental information about the heart rate rather than just indicating whether it’s more or less than 100 percent; to see the heart rate improving would give the birth attendant confidence to keep going. Dr. Olson agrees but points out that including more information and technology on the clamp itself would add to the cost of an item that’s intended to be disposable and could make it more difficult to interpret results. Then Wright has an idea. What if this clamp has a sensor that speaks to the tray, and the tray, would display the information? After all, the tray wouldn’t be disposable like the clamp. He suggests creating a passive element in the clamp that would react to the umbilical cord pulsation and convey the pulse to a sensing coil in the tray. “A $10 sale price puts it in the reach of any birthing facility and maybe even some traveling midwives,” Dr. Cedrone says. So using a 3D-printed clip, aluminum foil, a basic RFID kit and some plastic board, the team sets out to create a working prototype of the umbilical clip and sensing board with digital display. Within 48 hours they achieve their objective. Dr. Cedrone reflects on the birth video Dr. Data showed them 48 hours earlier. With strengthened resolve, the team plans to develop the idea further. 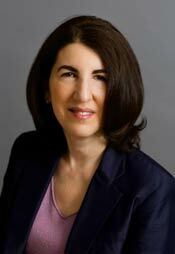 Join the team "behind the scenes"
Dr. Alison Bert (@AlisonBert) joined Elsevier in 2007 from the world of journalism, where she was a business reporter for The Journal News, a Gannett daily newspaper in New York. As Editor-in-Chief of Elsevier Connect, she works with people around the world to publish daily stories for the global science and health communities.